No, it's not the Food Fair you're thinking of! It's more closely related to this Food Fair but, I believe, with different owners. It joins two additional Food Fair locations in Newark (a former Fine Fare listed unfortunately on Google Maps as Fine Foods) and the Bronx (also a former Fine Fare). 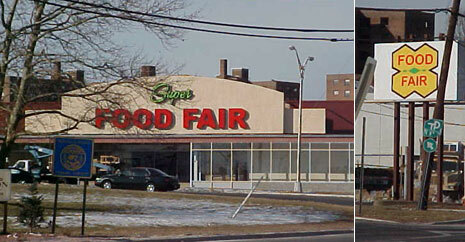 This particular location, in an industrial district of Paterson, opened as a Super Food Fair, using the old Food Fair logo, in 2009 after completely gutting a building previously occupied by a furniture store and before that, an original Food Fair. It seems that the Super Food Fair owners gutted the furniture store and fitted it with equipment that looks secondhand. Around 2012, the store was sold and slowly gutted again and completely redone with all new fixtures and decor, as well as flooring. At this time, the store re-branded as Food Fair La Gran Marqueta ("the big market" in Spanglish). There is no wasted space inside or outside. Carts are under the white awning to the left, and more merchandise is under the one to the right. The entrance is the open door in the middle. There is also an entrance on the side wall to the left, which is where the exit is also. When you enter, you turn right and walk along the entire front of the store, before entering into the REAL store at the far end of the building. The door on the right is the entrance; the door on the left is the exit. You can see that the entrance hallway you walk down to enter is an expansion and not part of the original building. Merchandise is stacked along the front wall of the store. At the end of the hallway you enter a very cramped but very nice produce department. This case on the right is along the front wall. As you make a left, the service departments (seafood/meat) are along the side wall. You can then proceed to the grocery aisles which run parallel to this wall. The track lighting is a nice touch. Also, notice that the department signage is in both English and Spanish, because of the neighborhood's large Hispanic population. The meat counter is toward the back of the store. Most of the meat cases, unfortunately, are still open coffin cases. However, the floor is very attractive. Looking back up towards the front of the store. You can tell how cramped the grand aisle is here. I have to give them credit for the well-stocked shelves! Proceeding along the back of the store, the grocery aisles begin to your left and dairy is along the back wall. This is the front of the first aisle. Notice how there is no way to get from the grocery aisles/front-end to the produce/meat department. All traffic going through the store must pass through the back aisle. Once again, you can see how packed with merchandise the store is and how cramped it feels. It must be a nightmare if it ever gets really busy. Looking towards the front of the store. The aisles are barely wide enough to fit two carts. You can also tell that one of the Food Fairs painted the ceiling, which really brightens up the store. I love the lack of wasted space - dairy cases with products hanging from the top and paper products on top of that! Around here, a very young boy came up to me and said, "Excuse me, can you help me find cheddar cheese?" Apparently he was shopping alone or in a different part of the store from his parents. That struck me as strange, since he was really young, maybe five or six years old. He was very polite, though, and we found cheddar cheese! The second-to-last aisle is frozen foods. These cases look fairly old, so they may be secondhand. The last aisle has dairy along one side and along the wall, bread, in-store bakery, deli, and hot food. It was surprising to me that Food Fair bakes in-store since most ethnic urban stores like this don't. The exit, past the registers, takes you out past the deli/hot food counter. You can see the plastic bags in this picture. What made them strange was every single one, without exception, was from Fine Fare. This was strange for me because I'd been to one Fine Fare, in Belleville, which used City Supermarket bags; the two places I'd gotten Fine Fare bags were here and Unique Thrift Store in Elizabeth, which uses all kinds of rejected bags from other stores. There is one row of parking along the front of the store but most is along the side. This Food Fair is a nice and modern store, and a great resource for the neighborhood, but is WAY too cramped for my tastes. It's clean and well-maintained, but unfortunately not as pleasant to shop in as it could be.